‘OpinionExplorer’ involved techniques such as mapping of opinions from planning consultations. It resulted in a visual interface to consultation data. The research explored shared representations and whether they aided spatial learning and thereby aided participation. 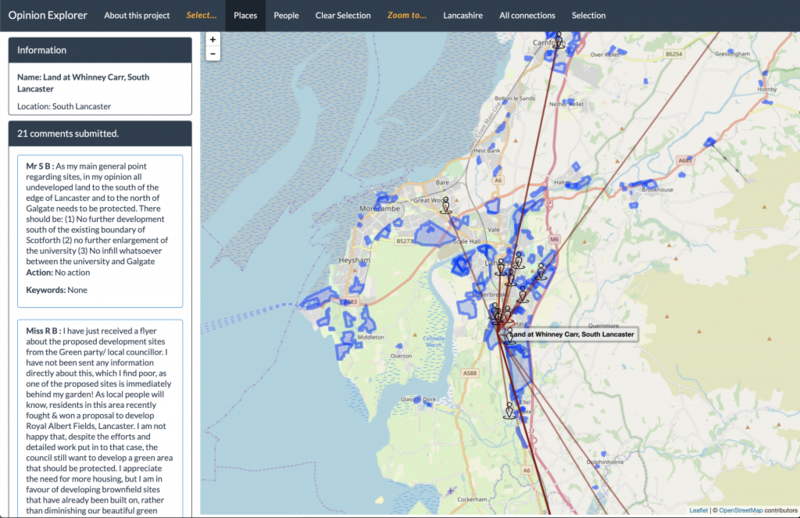 As the project progressed, the tool appeared to provide a new aspect of insight into the kinds of topics raised in planning consultations through the visualisation of commenting patterns. The interface prompted some interesting conversations with planning practitioners around transparency of planning consultations; and what level of transparency is desired and useful.